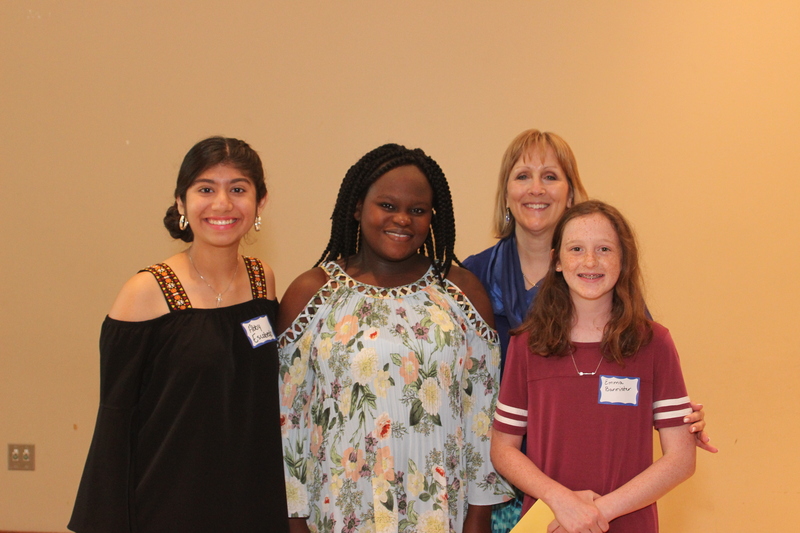 (Essay contest winners left to right) Abigail Escobedo, Caroline Jamus, Becky VanPool, Central Region Council of Catholic Women President and Emma Bannister. Blessed Stanley Rother personally inspires me because of his persistence to become a priest. Even though he failed multiple times, his ability to get up and keep going makes me want to do the same. When he was doing what he loved and adored, like serving his people and God, he was not sad, but overjoyed to be doing what he loved. When someone says “He is the Shepherd and we are his flock” I think about God and leading us to be his flock. The Bible states “He tends his flock like a shepherd: he gathers the lambs in his arms and holds them close to his heart; he gently leads those with young: (Isaiah 40:11). This is talking about Jesus leading us, but is also about Blessed Stanley Rother leading his flock in Guatemala. Without him what would the people do? Maybe still be living in fear. Blessed Rother gave them that freedom to live life not in fear, bur to the fullest. This is the way I want to be. A leader for my family, school, and church community. Blessed Rother acted the way Jesus did. We are made in God’s image, and if Blessed Rother can lead his flock, we can too. In conclusion, Blessed Rother is my top role model because of the way he lived his life. Thank you and God bless. There are always people in life who aspire to be something great. To have their name remembered, when all is lost. But there are also other who live a simplistic life, happily serving our Great Father. Blessed Stanley Rother was one of these people. Going by the example of the Messiah, he led countless amounts of his followers to our Lord. One of the many qualities I find inspiring of Fr. Stanley is his compassion. He poured his whole life into serving is parishioners. Another characteristic I value of this exceptional man is his joy. Not everyone put in his position would have the same cheerful attitude he had. Since the beginning of time, when love meets hate, sin always occurs. In this case however, Father Stanley Rother followed the example of Christ. When given the option between abandoning Jesus and his faith, he chose death. In all this vengeance, Jesus Christ told us, “If the world hates you, realize that it hated me first. If you belonged to the world, it would love you as its own; but because you do not belong to the world, and I have chosen you out of it, the world hates you.” a large quantity of people would take this passage and turn away from becoming a child of God, because of the unpopularity, or hardships that come along with this responsibility. Unlike most, Father showed us that what us right is not always easy, and what is easy is not always right. Just like Father Stanley Rother said,’ The shepherd cannot run at the first sigh of danger.” Instead of fearing the future, let’s focus on blessing others, and going back to the arms of our first love. The three qualities of Bl. Stanley Rother that I have found inspiring is that he went back to Guatemala for Holy Week even thought it was too much of a risk even of knowing that s group wanted to kill him. He was struggling with Latin, but this didn’t stop hi from being a priest. He came out to the three masked men even though that was his lat day. Those are the things I personally thought were inspiring about Blessed Stanley Rother. Blessed Stanley Rother was an American priest from Okarche, Oklahoma and died a martyr on July 28, 1981 in Guatemala. He’s served in the missionary in Guatemala for over 13 years. Fr. Rother was born on March 27, 1935. When he was in high school, he started to consider to start the vocation leading him to the priesthood. Fr. Rother was then accepted and was sent to a Seminary in San Antonia, Texas. During his journey to become a priest, Fr. Rother was struggling with Latin. Because he was struggling with the language, he lad to leave because his grades were inadequate. But then, they decided to give him a second chance and he then still continued his journey to priesthood. Bl. Stanley Rother was enrolled at Mount Saint Mary’s Seminary in Emmitsburg, Maryland. He ended up graduating and was ordained a priest on May 25, 1963. Then he was given permission to join the staff at the diocese in Santiago Atitlan, Guatemala. When he preached at the church in Guatemala, he instantly connected with them because he learned to speak Spanish. Everything was going great, until one day. On July 28, 1981 at around 1:00 am, Fr. Rother was told that there were thee masked men cooking for him. When he went to the men, he was shot two times. After his death everyone was shocked to head the Bl. Stanley Rother died. The people f Guatemala said stuff like, “They’ve killed our priest.” Later then, his heart was buried under the altar of the church in Guatemala. Those were the things I’ve found inspiring about Ft. Rother from early life to death.